Baha'i temple in Wilmette, Ill.
One of the world’s youngest monotheistic religions is the Bahá’í Faith. It’s small – around 5 million-plus believers – but global and growing. The Bahá’í Faith has spread widely since its origin in Iran, then known as Persia, in 1844, and is today the world’s second most widely dispersed religion (after Christianity), practiced in more than 200 countries. Bahá’ís believe in progressive revelation — that God has sent divine messengers throughout human history to reveal divine will. Bahá’u’lláh (1817-1892), the founder of the Bahá’í Faith, is recognized as the most recent in a line of divine messengers that includes Abraham, Moses, Buddha, Zoroaster, Jesus and Muhammad. Bahá’ís believe that God’s message for modern times is global unity. They believe that humanity is a single race, so they emphasize racial unity, gender equality and dialogue among different faiths. Those core beliefs express themselves in commitments to universal human rights, women’s rights and education. Bahá’ís have often been persecuted, especially in Iran, and that suppression has also contributed to their public profile. Some 300,000 Bahá’ís live throughout Iran, making the Baha’i Faith the country’s largest minority religion. The persecution of Bahá’ís in Iran has been taking place since the religion began there in the mid-19th century. More than 200 Bahá’ís were killed in Iran between 1978 and 1998, the majority by execution, and thousands more were imprisoned. The Bahá’í Faith grew from currents at work in 19th-century Islam in the Near East. The independent monotheistic religion was founded in Iran (then Persia) in 1844. The Báb (Arabic for “gate”) was the forerunner of the Bahá’í Faith, paving the way for the founder of the faith, Bahá’u’lláh. Bahá’u’lláh was exiled from his native land and died in Akka (now Acre, Israel) in 1892. More detailed history is available at the U.S. Bahá’í website. View a five-part YouTube video series called Baha’u’llah and the Bahá’í Faith on the Bahá’í National Center’s channel. “Selections from the Writings of Bahá’u’lláh,” posted on the Baha’i World wesbite, gives various Bahá’í texts meant for reading or browsing broken down into writings and topics. Estimates put the number of Bahá’ís at more than 5 million worldwide, with about 160,000 in the U.S. Listen to radio podcasts interviewing Bahá’ís about their personal stories and religious concepts of the faith. Bahá’ís follow a calendar of 19 months of 19 days each, adding four “intercalary” days (five in leap years) to synchronize the year with the solar calendar. Each Bahá’í community holds a feast at the beginning of each month. The Bahá’í Faith has no clergy or sacraments and only simple rituals to mark major life transitions such as marriage and burial of the dead. Bahá’ís gather in homes or Bahá’í Centers for collective prayer. Larger communities maintain centers. Devotional programs, which can be hosted by any member of the community, feature reciting or chanting from the Bahá’í sacred writings as well as writings from the other major religions. In addition to gathering together to pray in groups, Bahá’í are enjoined to pray and meditate privately each day. A period of dawn to dusk fasting from March 2-20 is considered a time of introspection and spiritual purification. 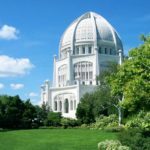 The Bahá’í House of Worship for North America is in Wilmette, a northern suburb of Chicago, and one of only seven Bahá’í temples in the world. View a two-part video tour of the Bahá’í House of Worship for North America. View photo galleries of Bahá’í temples and holy places around the globe compiled by the Bahá’í International Community. Bahá’ís have no clergy. More than 11,000 elected local and 182 national spiritual assemblies are responsible for business and administration. A nine-member Universal House of Justice is the international governing body that meets in Haifa, Israel, the world headquarters of the faith. The election process for the Bahá’í administrative councils at the local, national and international levels is distinctive. The process occurs without nominations, candidacies, campaigning or prepared ballot. All Bahá’í elections occur through secret ballot and plurality vote. Every adult Bahá’í in the community is eligible for election to the Bahá’í councils, all of which are made up of nine members. Local, national and international Bahá’í elections are typically held during the 12-day Festival of Ridván (pronounced “RIZ-von”), April 21 to May 2. All Bahá’í communities are involved with the election process in some way and can be a good source of stories during that period and also in October, when conventions are held to elect 171 delegates from across America who will then vote in the national elections in the spring. The first national institution in the entire Bahá’í world was formed in Chicago in 1909. The Bahá’í site has resources on the topic of governance. Arash Abizadeh, an assistant professor of political science at McGill University in Montreal, Canada, has written on the topic of governance in the Bahá’í faith. His research focuses on democratic theory. Michael Karlberg, associate professor of communications at Western Washington University, is the author of Beyond the Culture of Contest, which includes an examination of the Bahá’í system of governance. As in the Islamic faith from which it sprang, Bahá’ís find it spiritually important to visit their holiest sites, located in and near Haifa, Israel. The Bahá’í World Centre there includes a number of administrative centers, among them the Universal House of Justice that governs the faith. The burial places of Bahá’u’lláh and the Báb are nearby. Finding pilgrims may be one way to localize a story about the Bahá’í Faith. View a 12-part series on pilgrimage produced by the Bahá’í National Center. Many faiths emphasize service, with some recommending, or requiring, youth as the best time of life for service or witness. Some Bahá’í youth take time after high school or during college to perform service for the Bahá’í Faith, sometimes in international locations. View a two-part series on a Native American Bahá’í family and their children’s local and international service experiences. Fasting from March 2-20, a period that marks the last month of the Bahá’í year, is a distinctive practice of the faith. Others faiths also place a value on fasting, so this practice can be occasion for a story about the Bahá’í Faith or a comparative religions story that incorporates the Bahá’í Faith. See a photography blog that details the 19 days of Naw-Rúz fasting thorough creative expression around the world. The official website of the Bahá’ís of the U.S., which has its headquarters in Evanston, Ill., is a treasure trove of basic information about the faith’s beliefs and practices. Its online press kit includes statistical information and story ideas. See the website of the Bahá’í International Community, which has its headquarters in Haifa, Israel, where the faith’s holiest sites are. Bahaikipedia is an online encyclopedia about the Bahá’í Faith. As with any open-source collection, journalists should check all references and statements in the entries. Taken from www.bahai.us. The nine-pointed star is a symbol of Baha'i faith. The ringstone symbol is meant to serve as a reminder of God's purpose for man. The Greatest Name symbol is a calligraphic form of the word Baha. Bahá’ís are the largest religious minority in Iran. Around 300,000 live in the country, which has persecuted them since the religion originated there in the mid-19th century. Read the 2012 Annual Report of the U.S. Commission on International Religious Freedom, which describes the situation of the Bahá’ís in detail beginning on Page 82. The U.S. Bahá’ís also track developments. Because of the persecution of Iranian Bahá’ís in their native country, an appreciable number of Bahá’ís originally from there now live elsewhere around the world. Bahá’ís in Egypt also face discrimination. View an Aug. 31, 2010, CNN interview with an Iranian woman about Bahá’í persecution in her homeland. The Bahá’í National Center YouTube channel has a video of Iranian President Mahmoud Ahmadinejad at a Sept.25, 2007, U.N. news conference answering questions from a Voice of America reporter about how Iran’s government can justify its policy of eradicating the Iranian Bahá’í community. A 30-minute documentary called Education Under Fire is drawing attention to Iran’s de facto policy of preventing Bahá’ís from attending universities because of their religious beliefs. The film, produced by Single Arrow Productions and co-sponsored by Amnesty International, documents the growth and struggle of the Bahá’í Institute for Higher Education, a semi-underground university formed in 1987 to give Bahá’ís in Iran a chance to further their education. The Iranian government tried to shut down the institute in May 2011 by raiding more than 30 homes and arresting more than a dozen professors and administrators. C-SPAN recorded a two-part video of the U.S. House discussion of Resolution 1008, condemning the persecution of Bahá’ís in Iran. The emphasis on human unity, whether racial, cultural or theological, informs Bahá’í concerns about universal human rights. The Bahá’í International Community maintains a United Nations Office that works on human rights, sustainable development and the advancement of women. Bahá’í teachings prohibit Bahá’ís from engaging in partisan politics because they see partisanship as inherently divisive. Therefore, Bahá’ís may not join political parties, campaign for candidates in elections or participate in other forms of partisan activity. While many of the teachings of the Bahá’í Faith have political implications — promoting international peace or achieving economic justice in society, for instance — the Bahá’í approach to all social issues is to promote unifying solutions. The Bahá’í website has resources on the topic of Bahá’ís and politics. Racial unity is a key teaching of the Bahá’í Faith and an important goal of Bahá’í social action. While the popular saying holds that 11 o’clock on Sunday morning is the most segregated hour in America, the Bahá’í Faith is racially and culturally diverse. Local Bahá’í communities are excellent places to get perspective on race relations and cultural diversity. Race Unity Day, celebrated on the 2nd Sunday in June, was established in 1957 by the Bahá’ís of the U.S. According to the Encyclopedia Britannica, the Bahá’í Faith is among the most geographically widespread and fastest-growing religions in the world, with annual growth rates consistently in excess of 2 percent per year in the past century. In the United States, the faith grew seven-fold between 1960 and 1975 (from 10,000 to 70,000 adherents) and then more than doubled during the subsequent 30 years. As a result, Bahá’ís have faced the challenge of sustaining rapid growth and nurturing a strong Bahá’í identity in a community dominated by first-generation believers. The problem is particularly acute in a faith community without clergy or professional missionary or pastoral roles. In response, Bahá’ís are currently midway through a global 25-year effort to create a grassroots educational system using volunteer tutors to impart the faith’s fundamental beliefs and empower new adherents to put the faith into action through service to the larger community. Major areas of focus include spiritual education for children, mentoring of teens and pre-teens, hosting of prayer gatherings and tutoring in adult study circles. Bahá’ís maintain a network of seasonal and year-round schools in the U.S. that offer programs for children, youth and adults. Green Acre Bahá’í School, Retreat and Conference Center in Eliot, Maine; Louhelen Bahá’í School, Retreat and Conference Center in Davison, Mich.; and Bosch Bahá’í School, Retreat and Conference Center near Santa Cruz, Calif., are three places that draw Bahá’ís from across the country. Local spiritual communities also organize classes, and the U.S. headquarters offers a variety of resources. The Bahá’í Faith was born at a time when the power of science to explain things was growing exponentially. While religion and science are frequently seen in tension with each other, Bahá’ís view religion and science as two compatible ways of knowing. This has implications for today’s important ethical questions, particularly in medicine. Bahá’ís have distinct takes on the evolution versus creationism question and the challenges of sustainable development and climate change. As in every other faith, Bahá’ís experience dissent. Because of a clear line of succession and explicit teachings in the sacred texts regarding the institutional framework of the faith, the religion has been free from major schism. Some splinter groups have emerged during times of leadership transition as “reform” or “orthodox” Bahá’ís, but Bahá’í officials say these groups have perhaps a few hundred adherents and their views would not be considered mainstream by the vast majority of believers. Because the faith values unity, dissent does create tension. Bahá’í dissidents have found a voice on the Web. The 2007 article “Marginality and Apostasy in the Bahá’í Community” examined the question and elicited response. Some dissident sites include Bahá’í Rants; a blog by Sen McGlinn, an independent academic who was “unenrolled” or officially dropped from membership in the Bahá’í Faith; and a Yahoo! Group for ex-Bahá’ís. Rainn Wilson, who stars in the hit TV show The Office, has been very open about his Bahá’í Faith and about what it’s like to be a religious person in Hollywood. He recently launched SoulPancake.com, an online social network to facilitate conversations about religion and spirituality and “de-lamify talking about God and religion,” and talked about the site and his faith at the 2010 Religion Newswriters Association conference. Watch a YouTube video that showcases Bahá’í performers, including jazz great Dizzy Gillespie. Peter Adriance is NGO liaison for the National Spiritual Assembly of the Bahá’ís of the U.S. and co-chair of the faith sector team, U.S. Partnership for Education for Sustainable Development. Gwendolyn Etter-Lewis, with Richard Thomas, co-edited Lights of the Spirit: Historical Portraits of Black Bahá’ís in North America, 1898-2000, which featured, among others, jazz great Dizzy Gillespie. She is a professor of English at Miami University in Ohio. Layli Miller-Muro is a lawyer and the founder of the Tahirih Justice Center, a Bahá’í-inspired women’s advocacy organization in Falls Church, Va.
Nader Saiedi is professor of sociology and anthropology at Carleton College in Northfield, Minn. Born in Iran, he is the author of numerous Bahá’í books, including Gate of the Heart: Understanding the Writings of the Báb. Leigh Eric Schmidt teaches religion and chairs the religion department at Princeton University. He wrote Restless Souls: The Making of American Spirituality From Emerson to Oprah (HarperSanFrancisco, 2005) and can speak about expressions of American spirituality, including their role in 19th-century communal living arrangements. Restless Souls: The Making of American Spirituality From Emerson to Oprah includes a chapter on the early development of the Bahá’í Faith in America. Robert H. Stockman is an adjunct faculty member of the department of religious studies at DePaul University in Chicago. He is a Bahá’í who has written about the history of the faith in America. June Manning Thomas is Centennial Professor of Urban and Regional Planning at the University of Michigan, Ann Arbor, and a Bahá’í author. Her books include Planning Progress: Lessons From Shoghi Effendi. Richard Thomas, with Gwendolyn Etter-Lewis, co-edited Lights of the Spirit: Historical Portraits of Black Bahá’ís in North America, 1898-2000, which featured, among others, jazz great Dizzy Gillespie. He is a retired professor of history at Michigan State University. The Association for Bahai Studies—North America includes Bahá’í scholars from around the world. It publishes The Journal of Bahá’í Studies and holds an annual conference. Arthur Dahl is a member of the Bahá’í Faith, retired deputy assistant executive director of the United Nations Environment Programme and now coordinator of the UNEP/University of Geneva Programme of Advanced Studies in Environmental Diplomacy. He can speak about Bahá’ís and sustainable development and climate change. He lives in Geneva, Switzerland. Todd Lawson is an associate professor in the department of Near and Middle Eastern civilizations at the University of Toronto. A specialist in Islamic mysticism, he has written about the Bahá’í Faith. Green Acre Bahá’í School, Retreat and Conference Center in Eliot, Maine, was a site for the development of the Bahá’í Faith in America in the early 20th century. Michael Lazich is an associate professor in the department of history and social studies education at Buffalo State College in Buffalo, N.Y. He wrote the entry on the Bahá’í Faith in the Encyclopedia of Religious Ritual. Michael Penn is a member of the Bahá’í Faith and a psychology professor and licensed clinical psychologist at Franklin & Marshall College in Lancaster, Pa. His research interests and publications include works in the pathogenesis of hope and hopelessness, adolescent psychopathology, the relationship between culture and psychopathology, and the epidemiology of gender-based violence. Susan Maneck is an associate professor of history at Jackson State University in Jackson, Miss. She’s written extensively about various aspects of the Bahá’í Faith, including women in the faith. Gary L. Matthews is a Bahá’í author, publisher and lecturer. His publications include numerous short works on the Bahá’í Faith, Christianity and Islam, and the book He Cometh With Clouds: A Bahá’í View of Christ’s Return. He manages Stonehaven Press, which publishes Bahá’í literature, in Knoxville, Tenn.
Avrel Seale is an editor and writer in Austin, Texas. A Bahá’í, he journeyed to Haifa to visit Bahá’í holy sites, and his essay about the trip was published by the Austin American-Statesman. WLGI Radio Bahá’í is operated by the Louis G. Gregory Bahá’í Institute in Hemingway, S.C.
Winfried Corduan has written about the Bahá’í Faith in several world religions texts he has authored. He taught religion and philosophy for many years in the department of biblical studies, Christian education and philosophy at Taylor University in Upland, Ind. Elizabeth Gatorano is a lifelong advocate for children and troubled youth. Her husband is Rwandan. After the war in Rwanda she became actively involved in promoting racial unity. She wrote Waiting for the Sunrise: One Family’s Struggle Against Genocide and Racism. She is a Bahá’í who lives with her family in northwest suburban Chicago. Founded in 1931, Louhelen Bahá’í School, Retreat and Conference Center in Davison, Mich., offers educational programs for adults and youth. The Bosch Bahá’í School, Retreat and Conference Center near Santa Cruz, Calif., offers classes for Bahá’ís of all ages. Founder John Bosch, a Swiss national who came to America in 1879, studied with ‘Abdu’l-Bahá, the successor to Bahá’u’lláh. Desert Rose Bahá’í Institute in Eloy, Ariz., offers a variety of Bahá’í spiritual programs. Rhett Diessner is a psychology professor at Lewis-Clark State College in Lewiston, Idaho. He wrote Psyche and Eros: Bahá’í Studies in a Spiritual Psychology. Eliz Sanasarian is political science professor at the University of Southern California at Los Angeles and has written on gender distinction in genocide in the context of Armenia. She has written about the Bahá’ís in her book Religious Minorities in Iran.